snap, I’ve got the power! – RV Cheaper! January 10, 2015 January 19, 2015 RV Cheaper! snap, I’ve got the power! Back in early 2013, our generator froze up even though the oil was clean and at the right level. It had been running fine so figured it probably got hot and the piston must have seized up. I began shopping for another new or used unit. 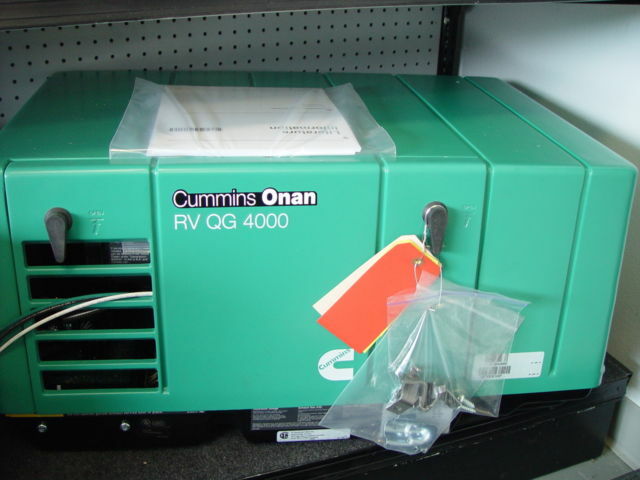 The best prices I found on new Onans was about $3100-$3200 for the 4000 watt model. I started shopping other brands, thought about the cheaper portables and looked for deals used Onan generators like ours. I setup an EBay search for RV QC 4000 and found a few units with less than 50 hours for about $1400-$1900. Once in a while a new unit came up and I would set a max bid of $2200 as my hot deal target and got outbid many times (same logic I used for the RV). I had bid on several auctions for new and used generators with a dealer that had a great seller rating. Then in May 2013, I won an auction with that dealer with $1950 on a brand new generator, that’s under my $2200 max bids and the best deal I could have asked for! My auction win, brand new Cummins-Onan RV QC 4000! Once I received the new unit I began reading the instructions. Pulling out the old unit I noticed some really goofy wiring with an extra electrical junction box and a lame splice job that was going to made hooking up the new unit very confusing. After looking at it a while I realized a previous owner had replaced the generator with a used one that had a really short set of house wires. 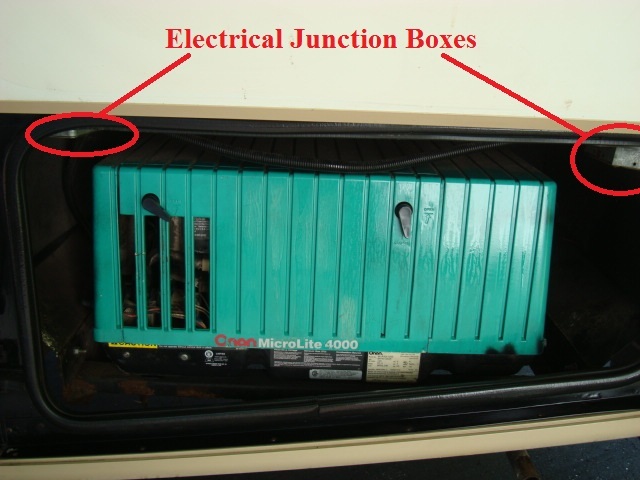 They added the extra j-box since the generator wires couldn’t reach the original j-box. I tore out the extra box and wires and then my son helped me get the new unit in and I bolted it in. I was able to get the wiring back to the original factory j-box and connected properly to the house wiring. Getting the wiring right ended up eliminating a problem with the microwave shutting down frequently when running the generator, now I didn’t have to worry about replacing the microwave! One of the other issues I had was hooking up the remote start switch and hour meter in the dash. There was no plug to the old generator and the color coded start/run/hour meter wires did not match any old or new Onan manuals. I bought a new hour meter, new house harness plug and tried figuring out the wiring myself, but I just didn’t have any luck. I figured I would just have go out side to start the generator for a while. I was talking to my brother in-law Larry and he offered to look at it during the July 4th weekend family get together at their place. After doing a few checks of the schematic diagram and using an ohm meter, Larry got my wires hooked up the right way and we soldered the new harness, insulated with shrink tubing, installed the new hour meter and everything has been working great since! Fast forward to January 2015, I decided to check out the old generator to see if I it looked like something I could tear down to install new parts to resell (used units are selling for really good prices). 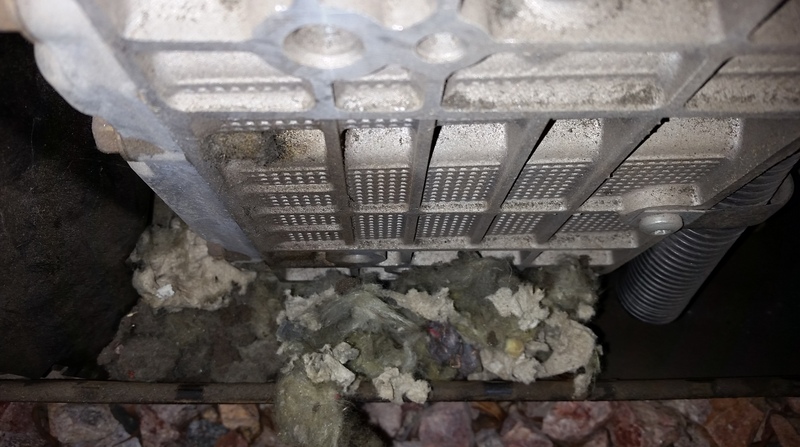 Once I removed the old cowling, I found a rodent nest inside and a carcass jammed in the cooling fan. I cleared out what I could and found the engine is not frozen and still turns over great! Now I just need to take a shop vac to it, add a harness plug so I can show buyers it runs good and help next owner hook up to their RV. Selling the old unit will add to the savings on the new generator and really make this appliance in the RV Cheaper! Previous bring it on 2015, Happy New Year!